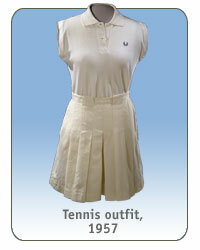 Gibson wore this traditional Fred Perry tennis shirt and Ted Tingling skirt in the 1957 Wimbledon tournament. Althea Gibson's trail-blazing tennis career delivered a crushing defeat to segregation. The poor South Carolina girl learned to play championship tennis at recreation and club programs in Harlem, New York. Gibson's success in the all-black American Tennis Association (ATA) gave her the confidence she needed to pursue the sport. Gibson turned that opportunity into a launching pad to a college education and a career in tennis. Gibson's dazzling performances at ATA tournaments and pressure from white tennis champion Alice Marble finally convinced the U.S. Lawn Tennis Association to cross the racial divide. In 1950, Gibson was the first African American woman to take to the court at the U.S. National Championships. In 1951, Gibson was invited to compete at Wimbledon—the first black player in the British tournament's 84-year history. She soon dominated international women's tennis, capturing both the French singles championship and the doubles title at Wimbledon in 1956. The Wimbledon singles championship was, and still is, considered the crown jewel of tennis. When Gibson took that title in 1957 and 1958, she left no question that African Americans belonged in the world of tennis.